Muhibbah Engineering (M) Bhd is a public listed company on the Main Board of the Kuala Lumpur Stock Exchange (KLSE). Muhibbah was the first company in Malaysia to achieve ISO 9002 certification in 1995 in the construction sector, placing strong emphasis on quality and safety in every aspect of operations, and also the first construction company in Malaysia to have accomplished this. Muhibbah is renowned for being a leader in Marine Construction; since its incorporation in 1972. Today, Muhibbah also stands firm in the various discipline of Engineering Construction, both locally and internationally. 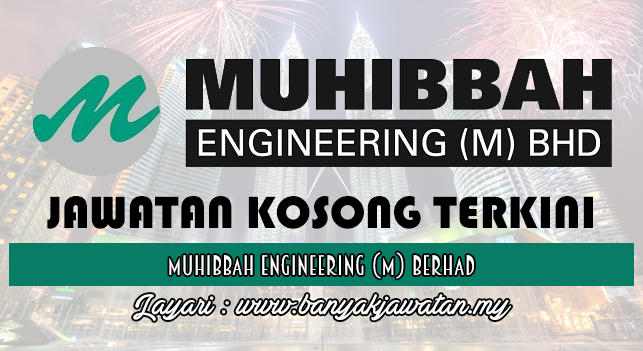 0 Response to "Jawatan Kosong di Muhibbah Engineering (M) Berhad - [CLOSE]"